Simble Solutions (ASX:SIS) has released its quarterly report for the period ended 31 December 2018. Overall, the report shows strong growth across SIS's operations, with the company clinching a number of potentially lucrative partnerships, and with all metrics trending in the right direction. Simble is an Australian software company focused on energy management and internet of things (IoT) solutions. The Simble Energy Platform, or SimbleSense, is an integrated hardware and real-time software solution that enables businesses to visualise, control and monetise their energy systems. SIS’s software as a service (SaaS) platform enables enterprises and consumers to remotely automate energy savings opportunities to reduce their energy bills. Simble operates in the SME and residential market and targets the distribution of its platform through channel partners. The small cap has an international footprint, with offices in Sydney and Melbourne, London, and Da Nang (Vietnam). 2018, meanwhile, represents the first full year of commercial focus for the Simble Energy Platform, a new revenue stream for the company. Since its IPO in February last year, Simble has announced contracts and orders worth up to A$4.9 million from its partners including Synnex Australia, Powercor UK and UCR Consultants (more on the latter in a moment). 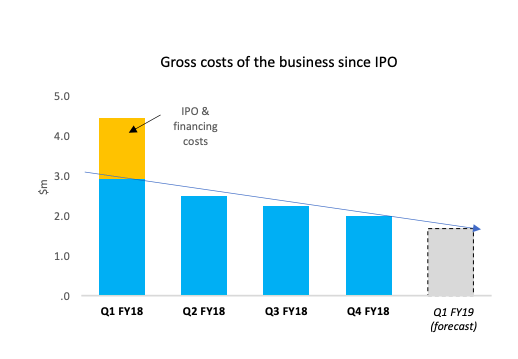 Encouragingly, Simble has reduced gross costs in every quarter since IPO, and has delivered a 124% increase in cash inflows in H2 FY18 compared to H1 FY18, as sales momentum gathers pace. During the quarter, the company’s net operating cash burn (excluding R&D tax offsets) shrunk for the third consecutive quarter to $0.62 million — a 15% improvement on $0.73 million in Q3, and a 40% improvement on $1.03 million in Q2. A major highlight was a pivotal marketing partnership with BidEnergy Limited (ASX:BID) to commercialise a bundled technology solution comprising of BID's Robotic Process Automation platform and Simble's IoT visualisation and data analytics platform, targeting business customers in Australia, UK and US. SIS also inked a strategic partnership with UK utility broker, UCR Consultants, with potential initial revenues of up to A$3.9 million, taking the cumulative order value for the Simble Energy Platform to A$4.9 million. Impressively, there was a 240% growth in customer sites on the IoT Platform for FY18 – a trend that’s poised to accelerate following the UCR partnership. Simble also expanded its product offering through the launch of its Virtual Analytics App (for residential customers) and SimbleSense Lite (for business customers) to meet market demand for low-cost software-only products without the need for on-site hardware installation. “The primary focus this year was on expanding the size and quality of Simble’s channel partner network, and while early results are promising, we’ve only begun to scratch the surface in terms of sales potential and market reach of our disruptive IoT data analytics platform. “We are currently in the final stage negotiations with a number of potentially significant customers and hope to make detailed announcements in the near future," Geha added. During the December quarter, Simble has continued to grow opportunities for its business in both the Australian and UK markets, setting a solid platform for sustainable growth going forward. Cash inflows totalled $0.78 million, consisting of $0.72 million in receipts from customers and a small R&D tax offset. Cash inflows for FY18 totalled $2.59 million, largely driven by cash collections of $1.79 million in the second half of the year — a 124% increase compared to the first six months of the year. Simble reduced the gross costs of the business for a third consecutive quarter to $1.99 million, a 12% reduction versus $2.25 million in the September 2018 quarter, and a 21% reduction compared to $2.51 million in the June quarter. Gross costs during the December quarter include a $0.66 million investment in R&D (up 17% compared to Q3) to support the company’s Virtual Analytics launch in the UK, and $0.35 million in cost of goods sold (up 41% compared to Q3) as a result of higher sales activity in the preceding quarter. Since its IPO, Simble’s focus on cost reduction has delivered tangible outcomes and significantly improved the economics of the company. One-off expenses in the first half of the year significantly strengthened its balance sheet, and a continuous focus on cost optimisation helped drive spending and reduce costs, while maximising business value. Further cost reductions are expected to be realised for the March quarter 2019 as a result of SIS’s strategic cost optimisation program. “Cash burn in the first two quarters was negatively impacted by legacy balance sheet costs, which evidently weighed on our performance and operating leverage,” Geha commented. “However, these issues are now entirely resolved, and we have also identified additional areas where improvements could be made. “The result is a much leaner and highly competitive company, poised to deliver more immediate results and incremental benefits to its bottom line as we execute on our growth strategy. I can confidently say that every metric is currently trending in the right direction." Excluding R&D tax offsets, net cash used in operating activities declined for a third consecutive quarter to $0.62 million — a 15% improvement on $0.73m in Q3, and a 40% improvement on $1.03m in Q2. Net operating cash burn declined despite a 41% increase in product manufacturing costs as a result of higher sales activity in the preceding quarter. Following a substantial reduction in gross costs, and as new business is being added, further improvements in cash flows are expected on average over time. However, due to the nature of the business of some partners, payment cycles, and the timing of R&D rebates, cash collections may be lumpy at times. Management said it is confident to deliver a combination of cash inflows from the Simble Energy Platform, the Mobility business and R&D rebates to fund the company’s operations and may also raise funds from alternative sources to pursue growth opportunities. During the quarter, SIS has continued to aggressively onboard customer sites to its energy data analytics platform, with each installation delivering recurring SaaS revenue, recognised on a pro-rata basis over the contract life. Orders of the Simble Energy Platform also include hardware components, which are recognised upfront, while most orders also include a service component, which is also recognised upfront. Over the three-month period, the number of customer sites on Simble’s IoT Platform increased 33%, taking the total user growth for FY18 to over 240%. This trend is poised to accelerate as a result of recently signed contracts, which will see a minimum of 10,000 meters across 6,000 customer sites added to the platform over the coming years. As the number of customer sites on the Simble Energy Platform continues to grow, the number of ‘devices’ or ‘meters under management’ will become an increasingly important gauge for business performance. Simble’s software solutions communicate with a wide range of devices, including energy meters and IoT devices, with the number of connected devices typically the key determining factor for the value of the sales contract. Meters under management have increased at a compound annual growth rate (CAGR) of 200%+ over the past three calendar years. As mentioned earlier, subsequent to the quarter’s end, Simble signed a three-year partnership agreement with UK-based utility broker, UCR Consultants, which manages over 40,000 customer accounts and in excess of 60,000 meters across the UK. Under the terms of the deal, UCR will deploy SimbleSense Lite to a minimum of 10,000 meters over the contract term with the potential to expand to up to 60,000 meters. 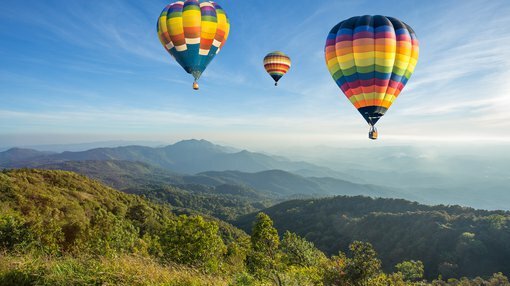 The minimum rollout target represents a minimum 20x increase of meters under management from current levels and the addition of well over 6,000 customer sites to the company’s platform. With a contract value of up to A$3.9 million if the internal target of both companies is achieved, this deal represents the first significant contract for SimbleSense Lite — a software-only entry-level SaaS product with low-cost deployment and rapid market penetration potential, without the need for on-site hardware installation. On top of that, Simble has inked a marketing partnership agreement with BidEnergy to pursue opportunities to commercialise a bundled technology solution. This end-to-end energy management solution comprises BidEnergy's Robotic Process Automation platform and Simble's IoT visualisation and data analytics platform, provided to business customers in Australia, UK and US. Under the agreement, Simble and BidEnergy will work collaboratively targeting large multi-site customers seeking an end-to-end energy spend, metering and carbon reporting solution to manage their utility portfolio and reduce their energy consumption. With an initial focus on Australia, UK and USA, the duo will identify key markets and target customers within each with a comprehensive and significantly strengthened value proposition. “The agreement between BidEnergy and Simble further builds on our partnership-led strategy creating collaboration opportunities where Simble will be able to demonstrate the scalable benefits of its powerful IoT analytics platform,” said Geha. “The Simble Energy Platform is an out-of-the-box Energy and IoT Analytics solution which beautifully complements BidEnergy’s unique Robotic Process Automation platform. It will allow end-customers to understand and control energy savings, carbon emissions and multi-layer environmental data, visualised by our powerful Big Data processing platform. " On top of that, in partnership with Cambridge Architectural Research, Simble has been awarded a £383,000 (A$680,000) UK government grant from the Department for Business, Energy & Industrial Strategy (BEIS) as part of a funding scheme to support energy efficiency projects in UK homes. The funding will be used to advance SIS’s Virtual Analytics App and its Big Data infrastructure to meet the objectives of the UK government’s program. Simble has expanded its suite of energy management solutions to meet market demand, accelerate user growth on its platform, and cater towards a larger range of industries and markets. Offered at various price points and customised for different target groups including enterprise, SME and residential users, Simble’s energy management and data analytics suites enable grid-connected premises to reduce energy wastage, automate control of their switch circuitry and monetise surplus microgeneration capacity. Each platform has the capability to run advanced algorithms in the cloud to offer smart analytics to the end user, feeding through to SIS’s Big Data infrastructure. Alongside its positive quarterly, SIS has announced that it has received commitments from a number of investors for $650,000 financing by way of a unsecured convertible note. The 2019 notes are convertible on or before 31 December 2021 at a conversion price of $0.15. The note conversion price of $0.15 — 134% higher than the closing price of SIS shares trading on the ASX as at 31st January 2019. The 2019 notes are cornerstoned by UK partner, UCR Consultants, subscribing for $500,000. The remaining noteholders are members of Simble’s board and executive management, as well as existing and new professional and sophisticated investors. For more detail on the key terms, see today’s announcement. Fadi Geha added: “We are delighted to have received such firm commitments at what the board considers favourable terms to shareholders. “The investment from UCR is the most effective way to nurture our partnership as it aligns our interests more closely. The 150% premium on the conversion price is a vote of confidence in the company and the recent progress we have made. “We welcome UCR to the company, and on behalf of the board, I would like to thank existing shareholders for their continued support." SIS plans to use these funds for working capital purposes to enable it to continue to commercialise the Simble Energy IoT platform through a channel partner driven sales strategy.